Hops is the2018 International Herb of the Year. It is a herbaceous perennial climber, and a member of the Cannabaceae family. It originates from North America to Europe and Western Asia, though it has found its way around the world and especially to where beer lovers and brewers reside. This is a fast-growing, hungry and thirsty herb. For optimal growth, it requires full sun, a well-drained good rich loamy soil of pH between 6.5-8, and lots of water, especially during the most vigorous growth period during spring to summer. Though the dormant root or rhizome is hardy, take care to protect the fresh shoots from frosts. Once out of dormancy, the vine or bine climbs vigorously, up to 80cm in a day! Their main roots grow deeply and there’s a proliferation of more shallow feeding roots, meaning they must receive sufficient water though the growing season, mulching assists moisture retention. Hop plants require a strong support system, as they can reach up to 6 meters. Rather than let all the shots grow, it’s best to select up to 10 good strong healthy ones and cut the balance out. As it is dioecious, both a male and female plant is required to obtain a harvest; it is wind pollinated. Being a perennial, it dies back completely in late autumn-early winter. Pest and disease wise, watch out for spider mites and mildew. The flowering part, the ‘cones’, or strobiles are called hops, also the new shoots. The harvest of the strobiles is somewhat dependent on the weather, usually from March to April. The more sunlight, the sooner to ripen, gauge by feel and smell, not damp, but light and papery, slightly sticky and fragrant, then dry them for storage, preferably in a dark airtight jar. Bitter, cold, dry and slightly pungent. Bitter principals & resins (incl. xanthohumol, lupulin (incl. valerianic acid, lumulone & lupulone), tannins, terpenes (incl. caryophyllene, farnesene, humulene, linalool, myrcenol & myrcene), phytoestogens (inc. prenylnaringenin) and flavonoids (incl. kaempferol & quercetin). Also, B-complex vitamins and minerals; magnesium, zinc, copper, some iodine, iron, manganese, fluorine and chlorine. Nervine, sedative, bitter, galactogogue, oestrogenic, anodyne, analgesic, antispasmodic, diuretic, anti-cancer and preservative. Hops have a wide range of uses medicinally. To relieve anxiety, including stress-induced palpitations, induce sleep, relive pain, and assist with hormone balancing, esp. for women during menopause (try stout or lager). Hops infusions are bitter. Perhaps, add a favourite flavour to the infusion, or perhaps, have a beer! Tincture 10-20 mls per week. Use the dried strobiles in a ‘hop pillow’ to assist sleep. It’s advised that those suffering from depression avoid using hops. Apart from using hops to flavour beer and other beverages, the young shoots can be picked when about 10cm long and prepare to eat, similar to asparagus, by blanching. The ‘sludge residue’ from beer making can be added to bread making, to add an interesting flavor, then there is this delicious cake to bake! Ingredients-Cake: 2 cups stout (such as Guinness), 2 cups (440 gms) unsalted butter, 1 1/2 cups unsweetened cocoa powder (preferably Dutch-process), 4 cups all purpose flour, 4 cups sugar, 1 tablespoon baking soda, 1 1/2 teaspoons salt, 4 large eggs, 1 & 1/3 cups sour cream. Preparation-For cake: Preheat oven to 180°C. Butter three x 20 cm round cake pans with 5 cm high sides. Line with baking paper. Bring 2 cups stout and 2 cups butter to simmer in heavy large saucepan over medium heat. Add cocoa powder and whisk until mixture is smooth. Cool slightly. Whisk flour, sugar, baking soda, and 1 1/2 teaspoons salt in large bowl to blend. Using electric mixer, beat eggs and sour cream in another large bowl to blend. Add stout-chocolate mixture to egg mixture and beat just to combine. Add flour mixture and beat briefly on slow speed. Using rubber spatula, fold batter until completely combined. Divide batter equally among prepared pans. Bake cakes until tester inserted into centre of cakes comes out clean, about 35 minutes. Transfer cakes to rack; cool 10 minutes. Turn cakes out onto rack and cool completely. As a dye plant, use green leaves and strobiles with alum and soda to obtain a gold colour, without a mordant, you obtain a good brown. Then there’s the hops sleep pillow; put the dried strobiles into a pouch and place inside the pillow case, or under the pillow. 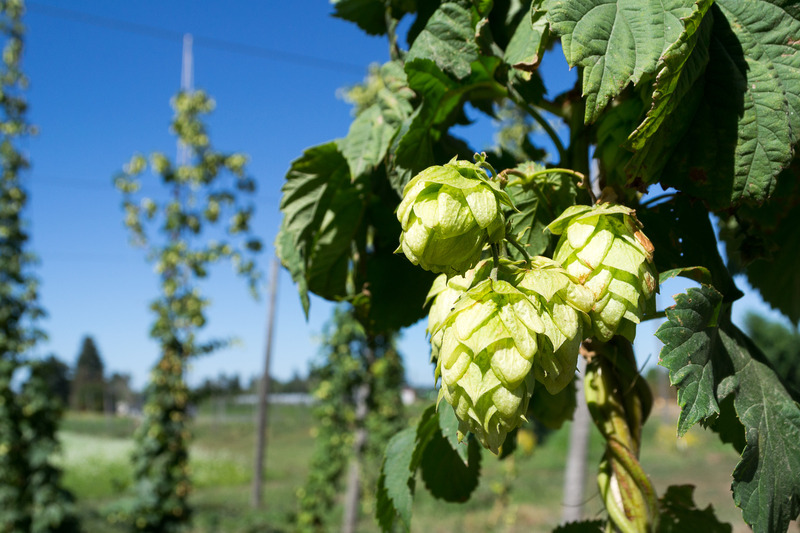 Hops have many common names, including; beer flower, flores de Cerveza and more. So what about the ‘mystery’ of this herb? It is considered to be of masculine gender, ruled by Mars and of the air element, its powers are of sleep and healing; a pillow filled with hops has had a long tradition as a sleep aid. It is also used in incense and other healing allies.